Android's commercial applications are a growing market. 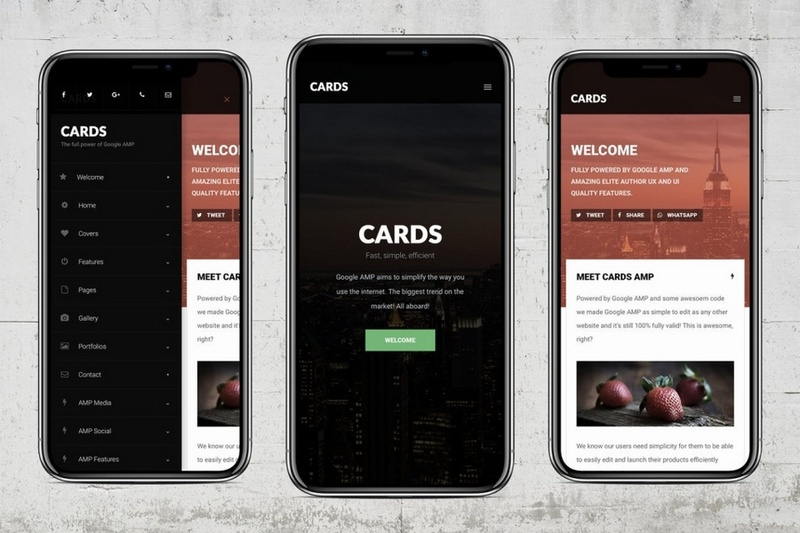 There are 18 beautiful and useful Android template for inspiration in 2019. Due to the increasing popularity of mobile devices and developer communities, Android commercial applications have become a growing market. 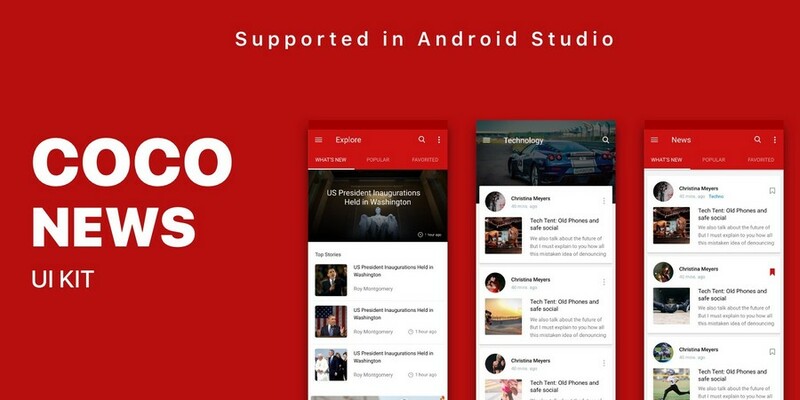 As such, it’s no surprise that there is a strong demand for Android templates. They reduce some tedious parts of coding and allow developers to focus on more pressing work. We hunted down 18 of the best business application templates for Android development and put them together in this article. 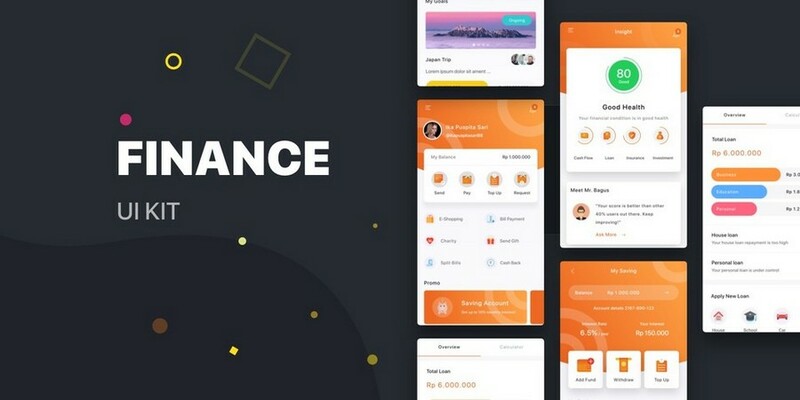 The templates include finance, education, service, and other industries, with rich variety, beautiful UI, and powerful functions. Let's take a look! 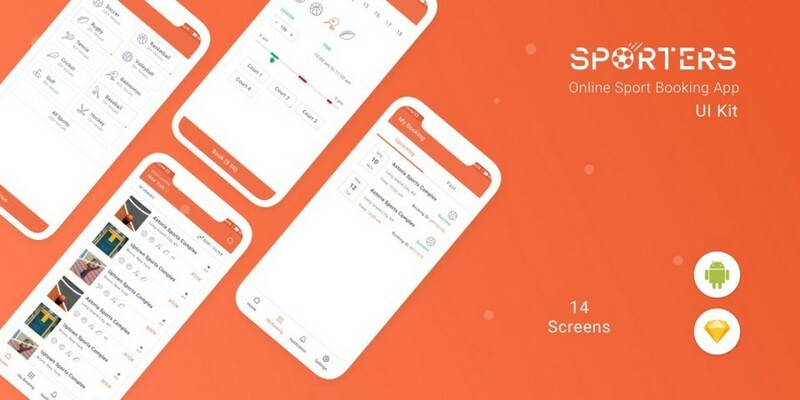 Sporters - Online Booking App is an authentic UI Kit which helps you to easily create a pleasing online booking app. It contains various screens for the user to take advantage of various benefits. Moreover, 10+ screens contain various useful features which help the user navigate from one screen to another. Every snippet of code is utilized; plus, layers are well organized and precisely named. Additionally, one can easily change text, colors, and graphics or place photos with little effort. Customized elements assist in easy editing. Pixel-perfect resolution leads to perfect design. Many freebies such as icons, fonts, and updates are also available. Finance is an application for online banking. This Android template contains a large number of fields and more than 40 beautiful icons, as well as more than 15 screens such as login, registration page, homepage, and category list. Everything follows a detail-oriented style that keeps up with today's latest mobile trends. This template is clearly coded, the layer format is accurate, the naming is precise, and the grouping is clear. You can customize the text by changing the text, colors and by adding or placing graphics and photos. 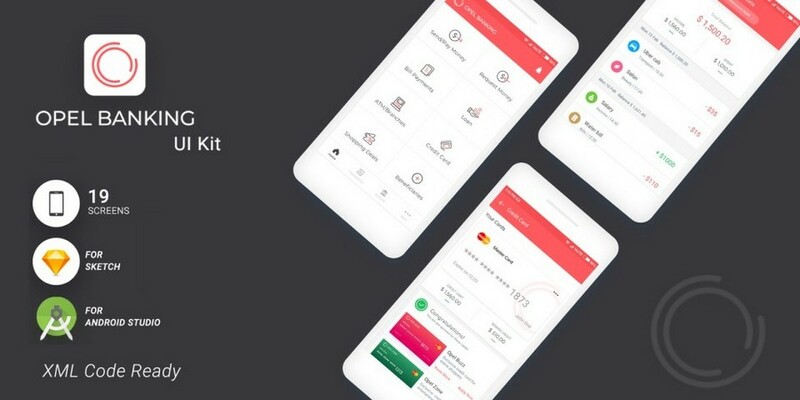 Opel Banking is an online wallet app that is quite popular these days. The app is simple and functional and includes all the necessary features of a wallet app. This template allows you to adjust font styles, font sizes, background colors, and other design elements. AMP Cards has a beautiful card-like design calculated to perfection for both small-screen and large-screen mobiles. It is built from the ground up for beauty and incredibly fast load times and is fully valid powered by Google AMP. With visionary code, AMP has one stylesheet for extremely easy editing. 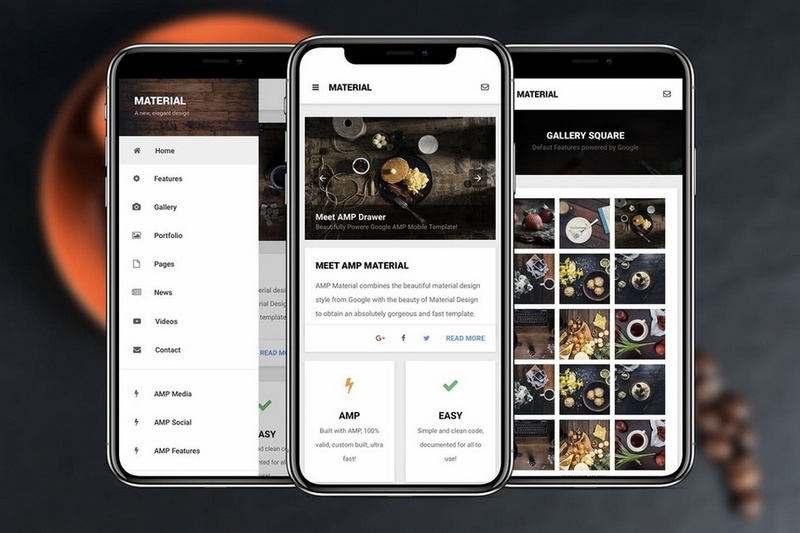 AMP Material is a Google AMP (Accelerated Mobile Project) website template designed to make your page load faster and rank higher in Google mobile search results. Google AMP pages show up with the lightning icon in the search results and load instantly when tapped. 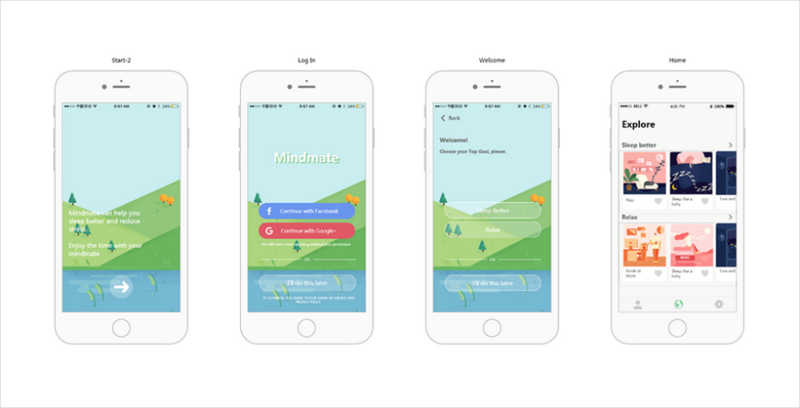 Mindmate is a health app that can help people relax and fall asleep quickly. It has very cute and fresh interfaces that consist of vivid illustrations. Import illustrations with “Image” components directly. Create the beautiful background of “Play” page with “Image” and “Model Screen” components. Create a dynamic progress bar by setting a “Move” command for a “Shape” component. Tencent QQ, also known as QQ, is an instant messaging software service developed by the Chinese company of the same name. QQ also offers services that provide online social games, music, shopping, microblogging, movies, and group and voice chat software. This prototype template has a lot of interaction effects, such as scrolling the interface of Stack Panel, clicking to trigger Pop-up Panel, selecting a component to trigger the change of button’s state, and so on. 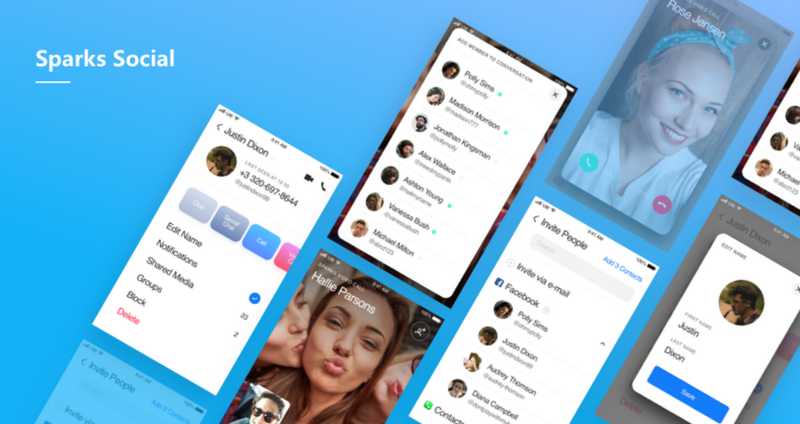 Spark Social, or Spark, is a matchmaking mobile app from DABSquared. Using geolocation technology and an internet connection, the app displays other people using it within a wide radius. 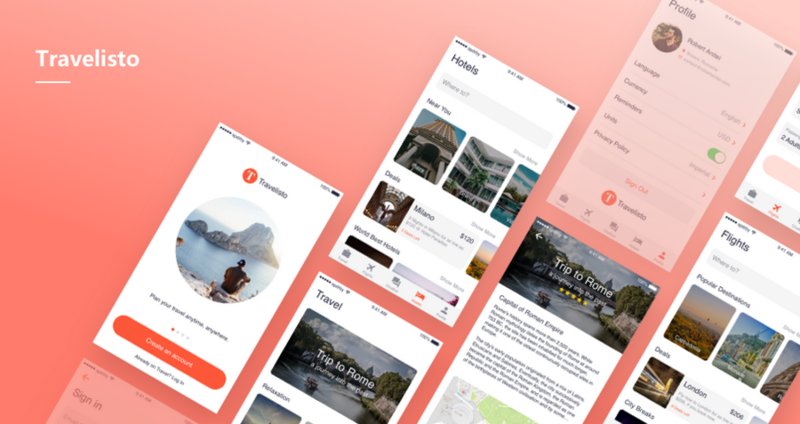 Hey Travelista is a global travel platform designed to inspire people to travel. Each week, Hey Travelista promotes a selection of exceptional hotel and travel offers at exclusive members-only rates with compelling value inclusions. Fitness Trac is an app for health management and scheduling time. 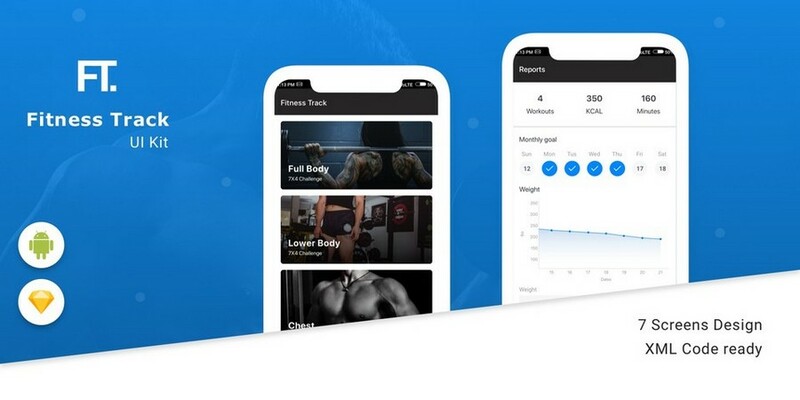 In this application, users can set the movement goals of each stage according to the time node, including exercise time, calorie consumption, etc. It also has detailed periodic data summary tables. This is a movie ticket booking application. 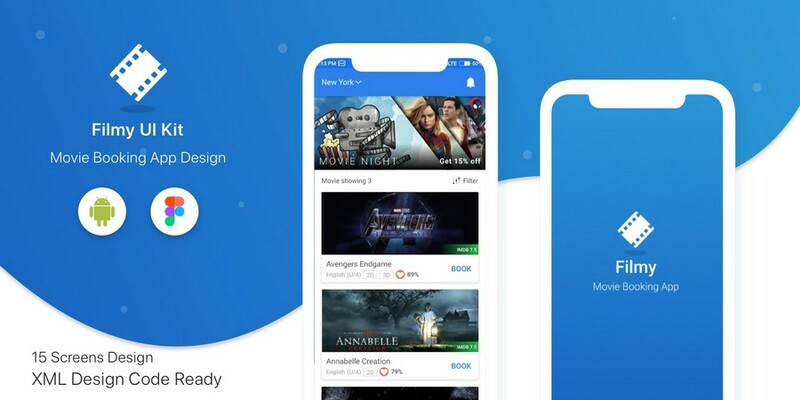 In this app, users can preview movie trailers, view and select the best movie tickets, and choose smart votes based on location. Pay2Wallet is an online payment application that can also be used for online banking. 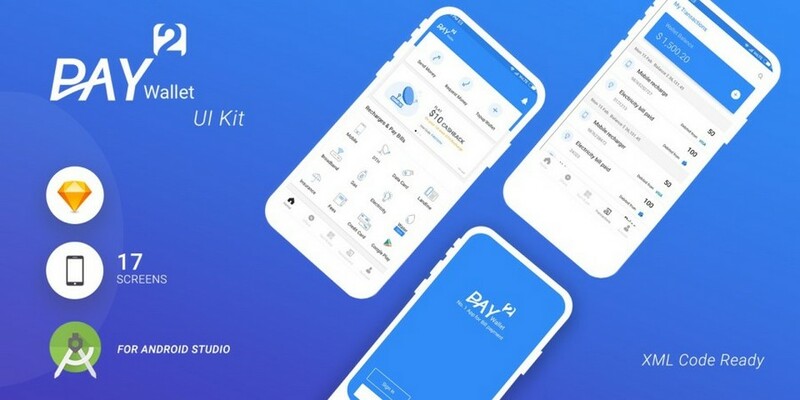 Rich and powerful, this online payment app provides comprehensive features including 17 pages and the most popular fingerprint payment options. It exudes brand strength with blue as the main color, though this scheme can be changed as needed. CoCo News is a news-reading application that can be used by online news publishing businesses. This app uses a typical large format with text layout mode and big pictures. The template includes more than 40 icons and 13 screens such as login, registration page, homepage, and category list. This is a beautifully-designed Android template for reading books online. 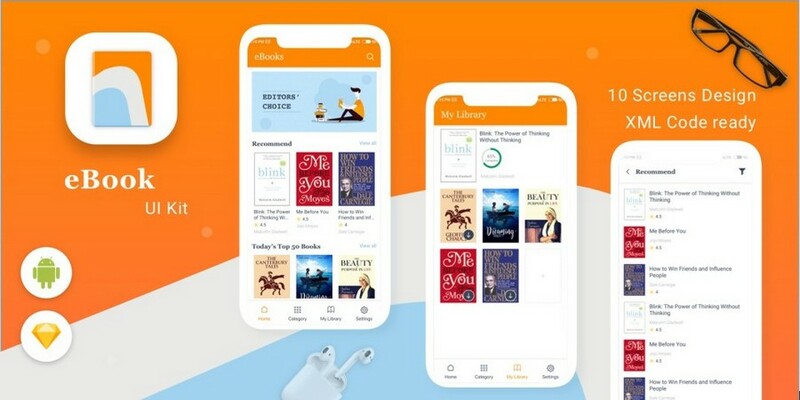 In addition to the text browsing mode and bookshelf mode that are common to online reading software, it also has the same functions as a music player, so that readers can listen to books when they don't want to read them. 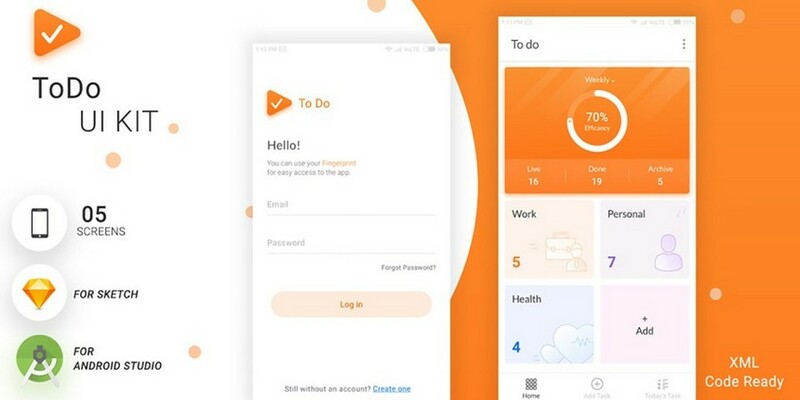 Todo is a task management app. This app is based on the date as a node to develop the tasks that need to be completed every day. 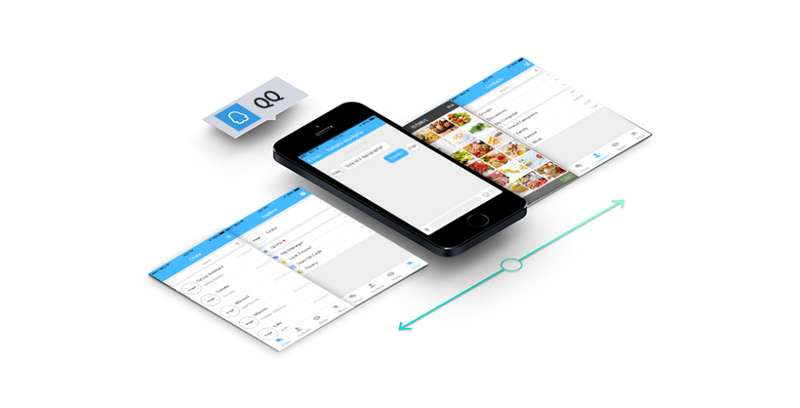 Multiple pages adopt the layout mode of a grid view, and the design is simple. The overall style is succinct and efficient. 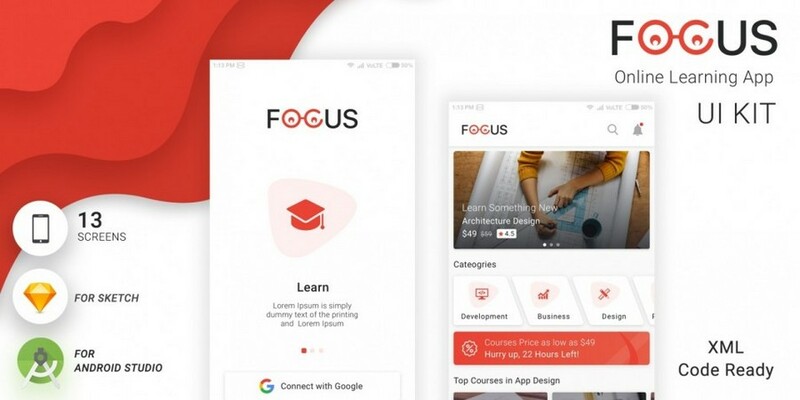 FOCUS is an application for online learning and course reservations. The template includes more than 60 icons and more than 15 screens such as login, optimization details, map views, and property lists. 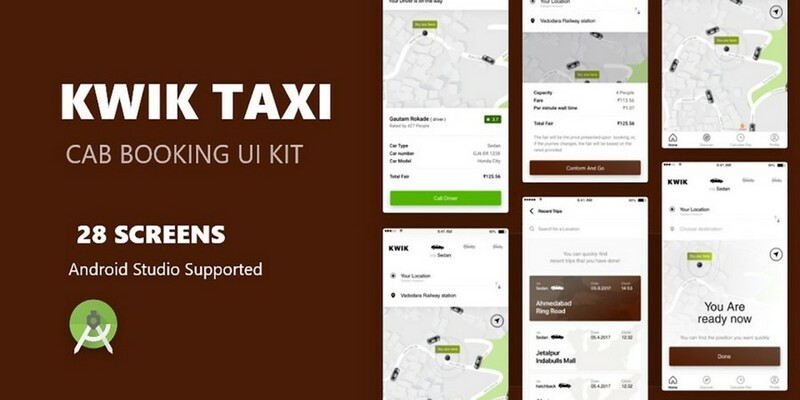 This is a taxi booking app. A map is integrated in many pages to draw a route between two points (original location and destination). This template contains comments in every XML and JAVA file for easy understanding. It includes more than 30 icons and 25 pages, such as login, OTP screen, and homepage. 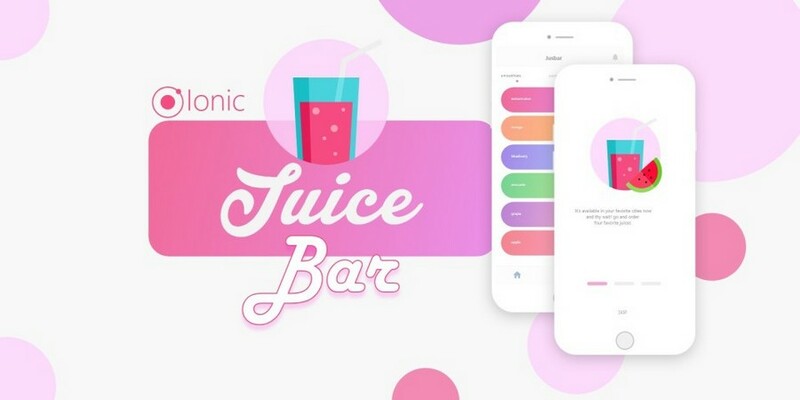 The Ionic juice bar UI theme is a beautiful app concept. The app has a cool color scheme and its features are easy to learn, making it easy to get started. The code required is simple.